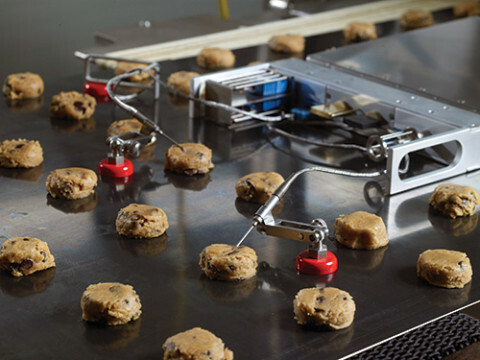 The Standard Product Insertion Probe is recommended for measuring product core temperature of biscuit, cookie, and bread products. It can be used with the Temp Sensor Array, Product Probe Interface and Temperature Interface. The maximum tip temperature is 260°C (500°F). 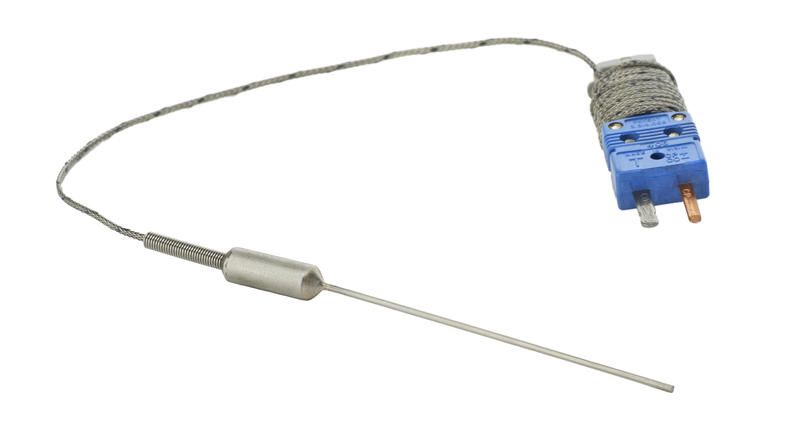 The standard probe is a 76mm (3”) long x 1.3mm (0.05”) diameter high temperature probe with a 1.2m (48”) stainless steel sheathed lead on an integrated wire spool (custom lengths available). The Hypodermic Product Insertion Probe is recommended for measuring product core temperature of thin cracker type products. It can be used with the Temp Sensor Array, Product Probe Interface and Temperature Interface. The maximum tip temperature is 200°C (400°F). 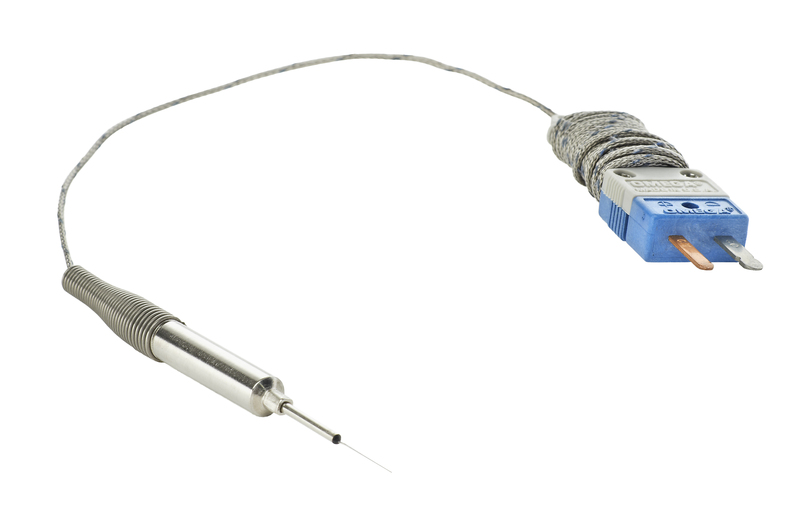 This probe is a 13mm (0.5″) long x 0.31mm (0.012″) diameter high temperature probe with a 1.2m (48”) stainless steel sheathed lead on an integrated wire spool (custom lengths available). 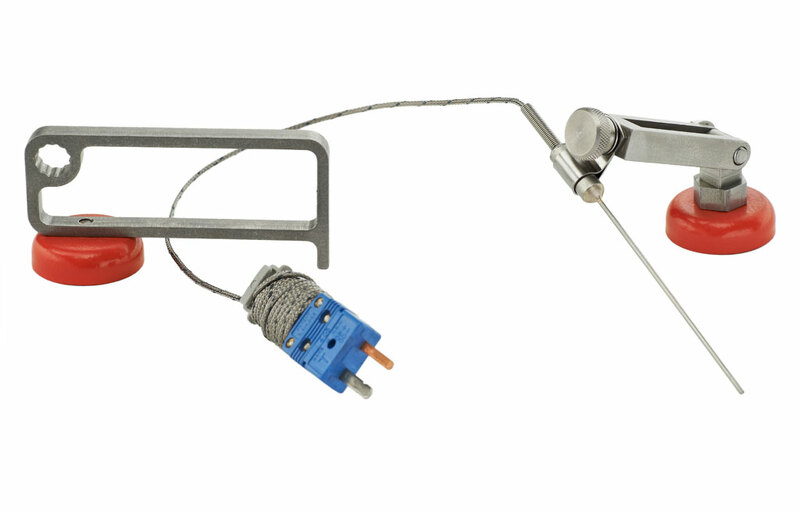 Reading Thermal offers a magnetic base Fixture that positively locates product probe in product and is fully adjustable for height and angle. A magnetic base wire hold down is also available to manage excess wire and serve as an adjustment tool.